The weather here is so weird today. We were pummeled with wet, heavy snow throughout the night but the temperatures are warming up so now it’s melting into even heavier slush. Not ideal running weather, unfortunately, so it was back to the treadmill today. It felt good! I was definitely pushing myself a bit harder while sticking to an 8 minute pace for the 5 minutes but not unbearably so. It amazes me how much harder running feels on a treadmill, I know that sounds crazy but my typical pace outdoors varies from 8:15-9:30 and sometimes 10 min miles feel hard on the treadmill. Outdoor running is just so much better, I need spring to be here NOW! 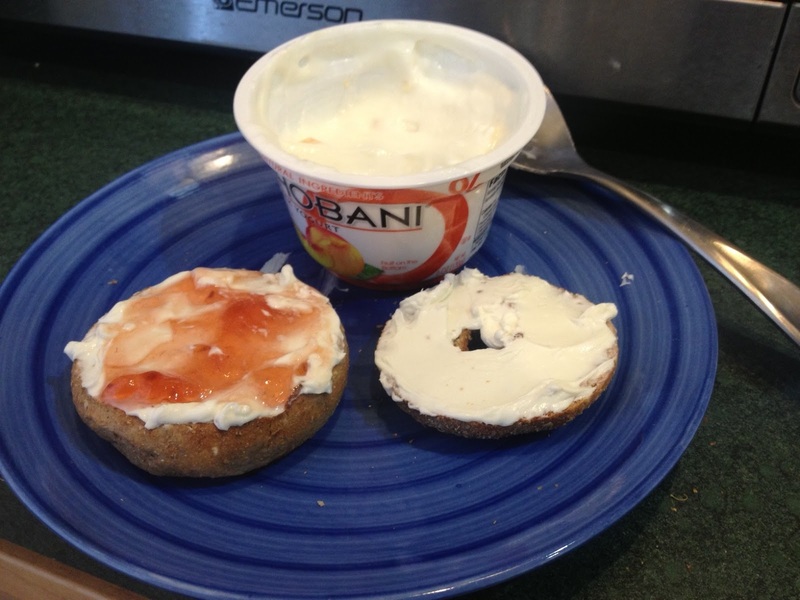 My new love, Chobani peach (so far I’ve tried the 2% mango and the 0% black cherry, but peach is still my favorite) and a mini whole wheat bagel with cream cheese and raspberry jam on half. I used to be obsessed with bagels + cream cheese and normally can’t keep them in house because I have no restraint but we had bought them for our visitors and it was a nice treat this morning. I’ve got a busy day at work and then a night time Jillian session planned, yay for two-a-days! I’m on track to have a very solid week training wise and I feel great about that. Time to chug some coffee and dive into paper work, happy hump day!